Can you believe it's May already?! 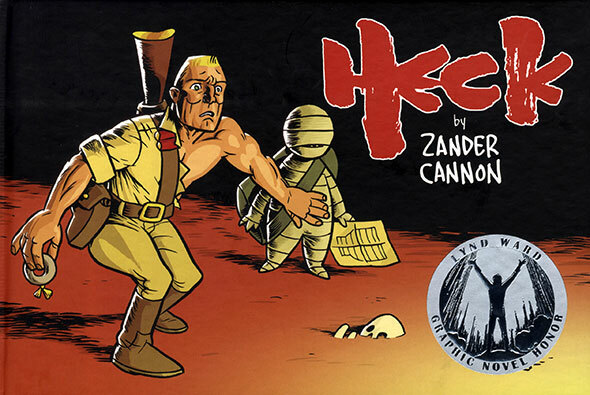 We've just finished celebrating FREE COMIC BOOK DAY with a new Top Shelf Kids Club comic book (containing free samples of Rob Harrell's Monster on the Hill and Eric Orchard's upcoming Maddy Kettle), which you can now add on to web orders for only 50 cents! The wait is over! 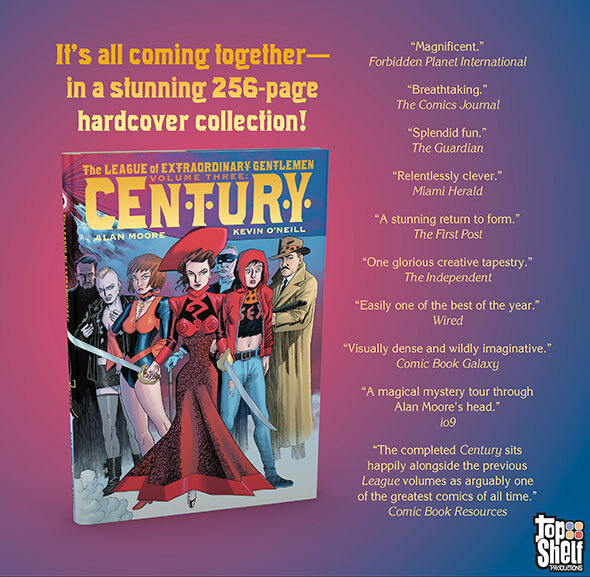 Five years after Alan Moore and Kevin O'Neill first brought their famous League of Extraordinary Gentlemen series to the trans-Atlantic partnership of Top Shelf (US) & Knockabout (UK), we're officially opening pre-orders for our most requested item: the collected "Century"! 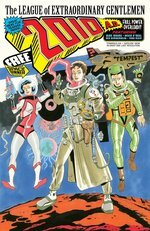 This 256-page hardcover, scheduled to hit stores in July 2014, will collect all three installments of The League of Extraordinary Gentlemen, Vol. III: Century. Spanning the League's adventures in 1910, 1969, and 2009, this metafictional epic sees Mina Murray and her dwindling allies race across time to prevent an apocalyptic conspiracy, while the world they once knew crumbles around them. Woven throughout, of course, are countless colorful characters from 100 years of British popular culture, from Marxist opera to reality television, pulp fiction to experimental film, and even a touch of rock 'n' roll. Discover the saga CBR called "arguably one of the greatest comics of all time"! -- 6 5/8" x 10 3/8"
-- Pre-order now for release in July! Also open for pre-order: the second printing of the critically acclaimed swan song by the inimitable dean of autobiographical comics, an autobiography of a man and a city: Harvey Pekar's Cleveland. -- Pre-order the new printing now for release in July! 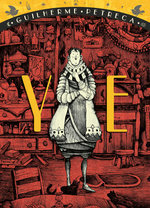 Coming in June: the acclaimed PINOCCHIO, VAMPIRE SLAYER complete in one volume! 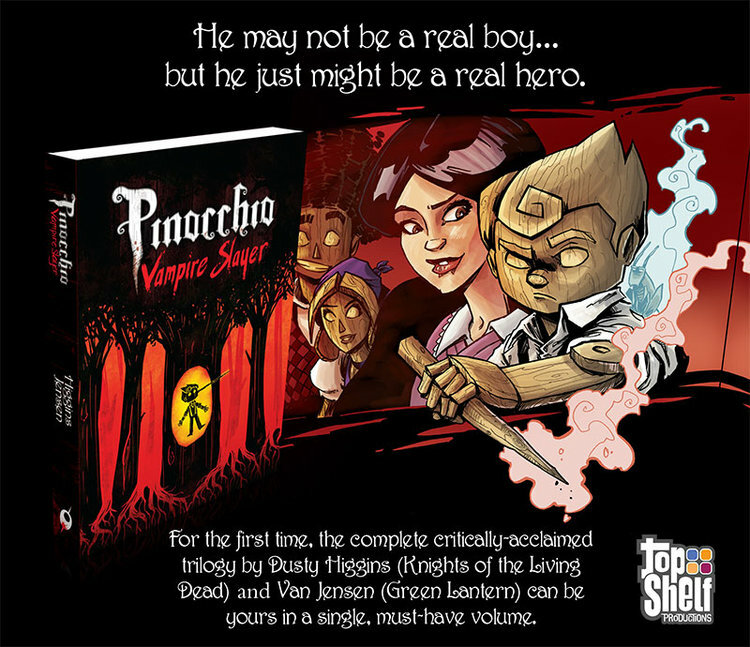 After gathering substantial praise for their individual volumes, artist Dusty Higgins and writer Van Jensen officially join the Top Shelf family this summer with the first-ever complete collection of Pinocchio, Vampire Slayer! Click through for more details and a 12-page preview. This puppet may not be a real boy… but he just might be a real hero. When bloodthirsty monsters invade Pinocchio's hometown and kill his father Geppetto, Pinocchio discovers a new benefit to his magical nose: telling lies produces a never-ending supply of wooden stakes to combat the vampire hordes! Will Pinocchio be able to defeat these horrors, avenge his father, and save his friends? 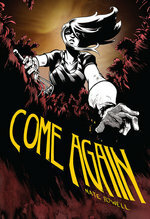 Jensen (Green Lantern Corps) and Higgins (Knights of the Living Dead) present a captivating blend of comedy, horror, romance, and adventure, rooted in the original Italian novel but brought - as if by magic - to new life. --Pre-order now for release in June! Plus: Liz Prince's essential WILL YOU STILL LOVE ME IF I WET THE BED?, back in print! Just as Liz Prince re-enters the spotlight with her delightfully misanthropic new book Alone Forever, we've headed back to print on her lovable debut! It's a must-have for any reader who's ever been in love. Grab your copy today, hot off the press! 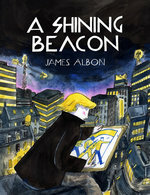 --a softcover graphic novel, 4" x 6"
Over six months after its publication, the phenomenon that is March: Book One continues to break new ground. 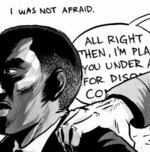 This graphic novel, the first in a trilogy by Congressman John Lewis, Andrew Aydin, and Nate Powell, has won tremendous acclaim, both as a great book on its own terms, and as an opportunity to reach new audiences. 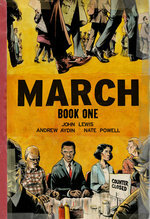 March is not only communicating to new generations about vital American history, it's also introducing the graphic novel format to countless new readers. Michigan State and Marquette University select MARCH! Michigan State University and Marquette University have both selected March as freshman required reading for 2014! 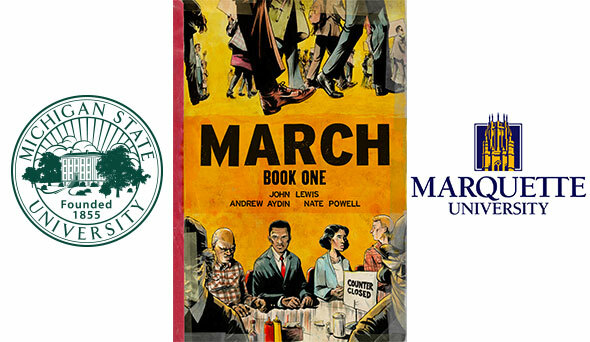 March: Book One will be featured in "One Book, One Community," a program in which Michigan State University partners with the City of East Lansing to read, discuss, and celebrate a book together as a community. Similarly, Marquette University in Milwaukee has selected March: Book One for its First-Year Reading Program, in which all incoming students spend the summer reading a common text and then discuss it during New Student Orientation. 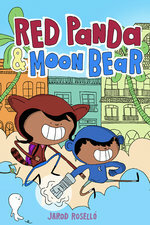 Together, these programs will see over 10,000 students reading this graphic novel simultaneously! 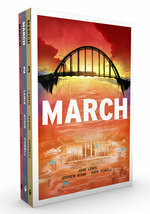 March: Book One is praised by New York State Senator Daniel Squadron with a glowing review in the new issue of O, the Oprah Magazine (April 2014, on newsstands this week): "A riveting chronicle of Lewis’s extraordinary life… it powerfully illustrates how much perseverance is needed to achieve fundamental social change." 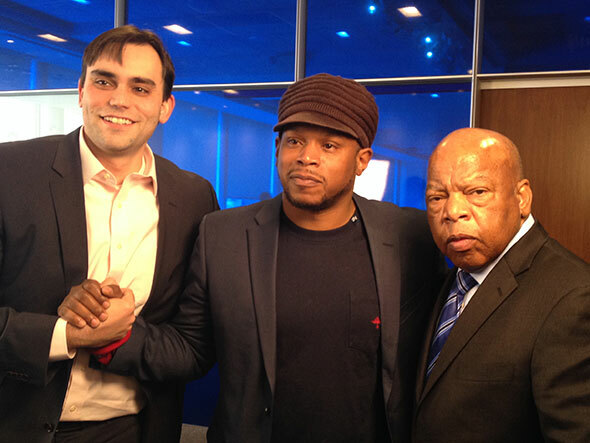 Last but not least, co-authors Congressman Lewis and Andrew Aydin recently taped an interview with MTV News' Sway Calloway, which will air on MTV shortly! 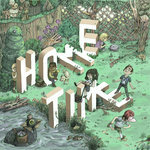 This month's pre-order announcement is a very special landmark for us at Top Shelf. When Brett Warnock and I decided to join forces at the Small Press Expo in 1997, we had one goal: to bring great comics into the world, comics that could be funny or charming, and full of subtext and heart. 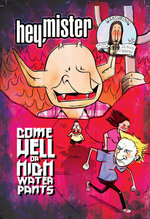 And the first graphic novel we ever released was Pete Sickman-Garner's wry and witty Hey, Mister: After School Special. Now, so many years later, we're pleased as punch to announce the return of Pete, and his whole cast of lovable Hey, Mister weirdoes, for their biggest adventure ever -- to Hell and back! 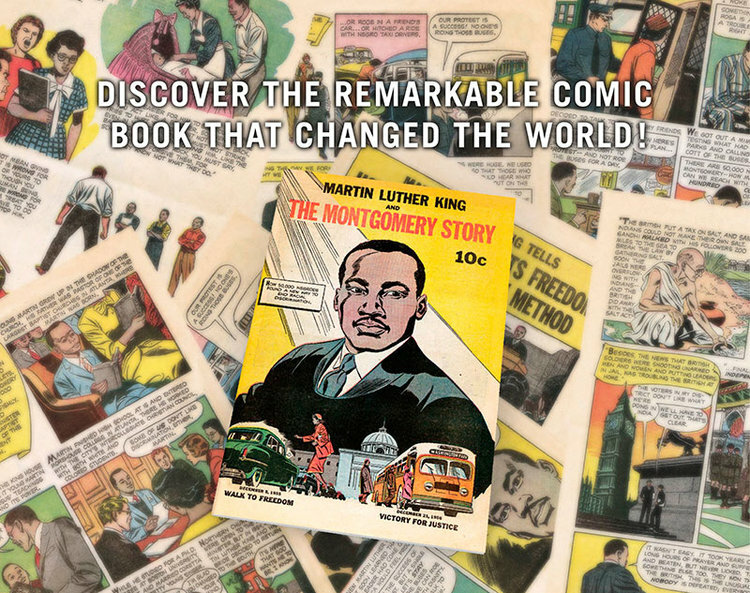 This 192-page self-contained graphic novel is a perfect introduction for new readers, while longtime fans will find extra treats lurking inside. 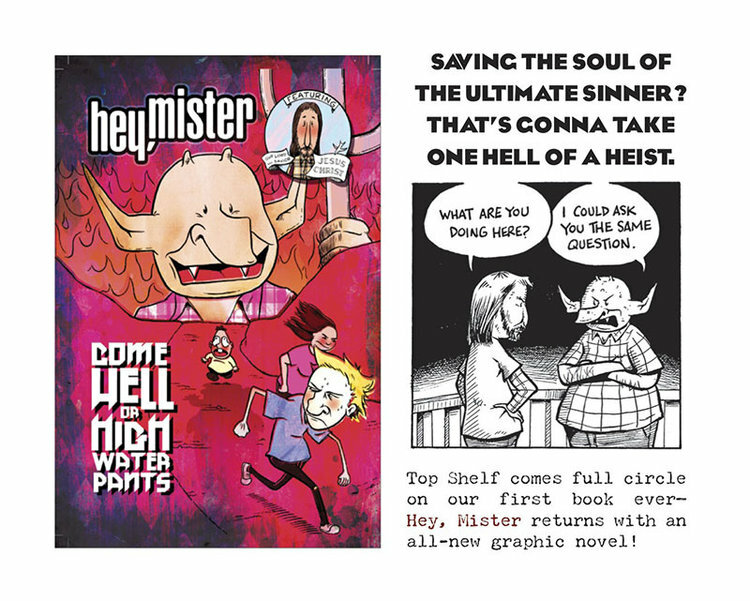 A 192-Page full-length graphic novel, 6.5" x 9.5"
Can Mister, Young Tim, and Aunt Mary help Satan sneak back into the underworld and retrieve his soul? Pete Sickman-Garner returns at last to his beloved cult-favorite series HEY, MISTER, rounding up the whole cast for one Hell of a heist job. Pre-order in the current Diamond Previews today for books shipping in May! Also coming soon: new printings of essential Top Shelf classics! 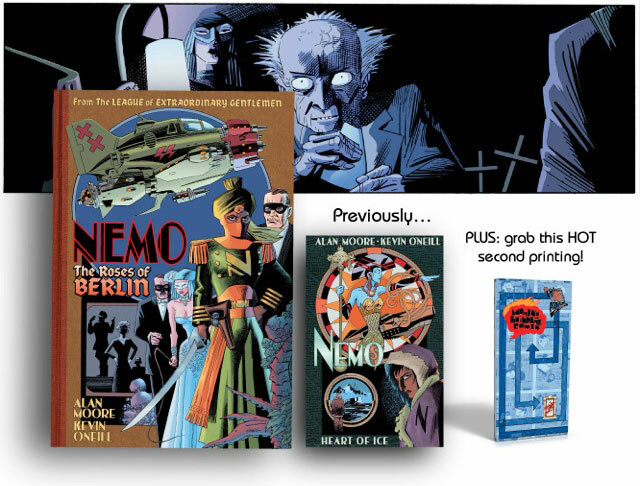 Now's the time to pre-order YOUR copies of the spring reprints of the Jeff Lemire library (The Underwater Welder, Essex County, and Lost Dogs) as well as the legendary Lost Girls by Alan Moore & Melinda Gebbie! New releases from Top Shelf in stores now! 2014 is off to a mighty beginning with these new releases! Head to your favorite store today to pick up The Bojeffries Saga by Alan Moore & Steve Parkhouse and Alone Forever by Liz Prince -- and stay tuned for the March 19 release of Nemo: The Roses of Berlin by Alan Moore & Kevin O'Neill as well as our reprinted edition of the timeless civil rights comic book Martin Luther King & the Montgomery Story (hitting stores in April)! Fans evidently agree! 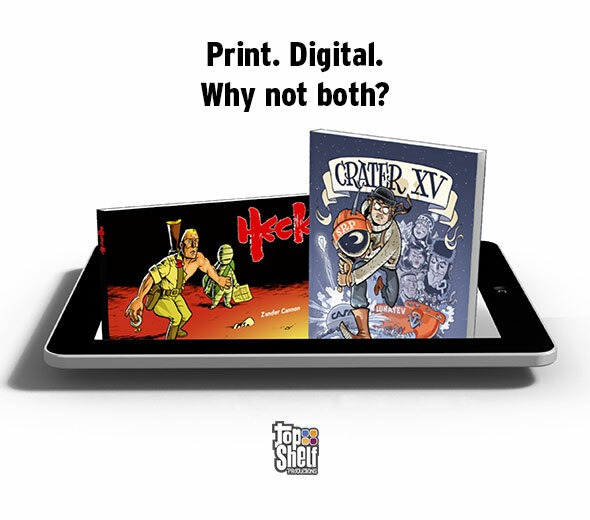 You've responded to our digital offerings with great enthusiasm, downloading Top Shelf comics by the thousands from excellent vendors like Comixology, Amazon Kindle, Apple iBooks, Kobo, BN Nook, and more, while continuing to shop for your favorites in printed format from your favorite retailers. What’s more, this new direct-download option allows us to launch another great feature: add-on pricing. 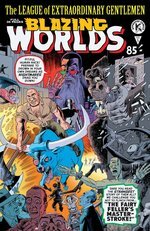 Starting today, customers who order select titles from the www.topshelfcomix.com online store can purchase both print and digital editions at the same time, for a substantial savings! 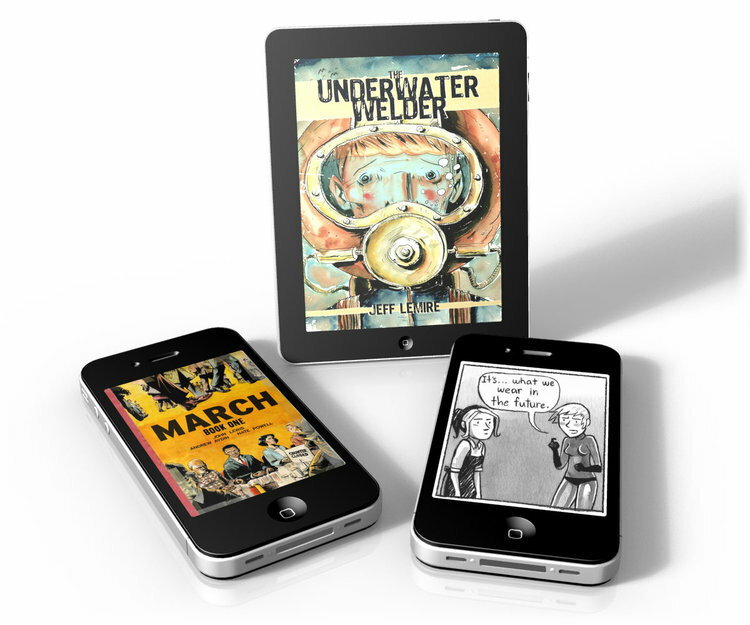 For example, Jeff Lemire’s The Underwater Welder is priced at $19.95 print and $6.99 digital, but now when ordering the print edition, it’s only $2.99 extra to add on the digital edition. One for home and one for the road? One for you and one for your sweetie? The choice is yours, with add-on pricing! Thanks as always for your support. Let’s explore the future of comics… together! Can you believe it's February already? Just in time for Valentine's Day, we've got a new release from the author of the award-winning fan-favorite Will You Still Love Me If I Wet the Bed? 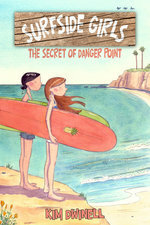 Yes, Liz Prince debuts her much-anticipated new book Alone Forever this week (in stores February 5)! But why let her be ALONE FOREVER when you can MEET LIZ PRINCE at one of her many events this month? And that's not all! Liz has expanded her reach by sending awesome prints of various Alone Forever comic strips for you to view and purchase at these worldwide gallery shows! With an opening party 2/14 featuring live music and raffle! 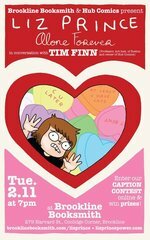 Featuring an exclusive bookplate edition of the Alone Forever book! Hope to see you on the road! For more details and a 7-page preview of the book, click here. 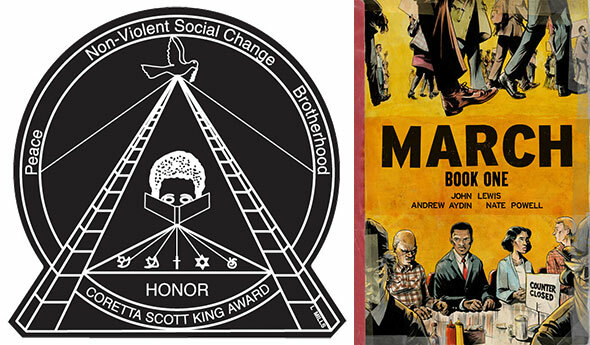 You may remember that the award-winning March trilogy is based on the 1950s comic book Martin Luther King and the Montgomery Story, which served as both an inspiration and an instruction manual for young John Lewis and many other activists of his generation. Now, in addition to launching the first fully-authorized digital edition of that comic book (both in a special bundle and on its own), we've partnered with the Fellowship of Reconciliation on a new physical reprint! "This is one of the books of this year. This is something that will be prominent in your career, no matter what direction it takes from here, for however long you continue to make comics." So begins Tom Spurgeon's long and wide-ranging interview with our own Nate Powell, award-winning author/artist of Swallow Me Whole, Any Empire, Sounds of Your Name, and now artist of March: Book One, one of the most talked-about and highly-acclaimed graphic novels in Top Shelf history. How does it feel to work so closely with a revered figure of American history? What does it mean to break through barriers for comics on television and in classrooms? What was the creative process to turn this powerful narrative into such innovative comic book pages? Tom and Nate get deeply into it, making this interview a must-read. Check it out! 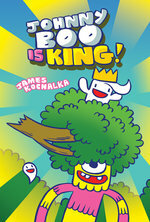 First, James Kochalka returns to his raunchy cult-classic SUPERF*CKERS with a 16-page seasonal special! 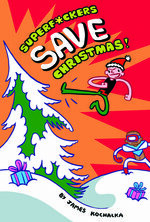 Yes, it's a timeless holiday gem for the modern age, SuperF*ckers Save Christmas! Grab this digital delight today, and it can be Christmas in your heart (and your tablet device) all year round. 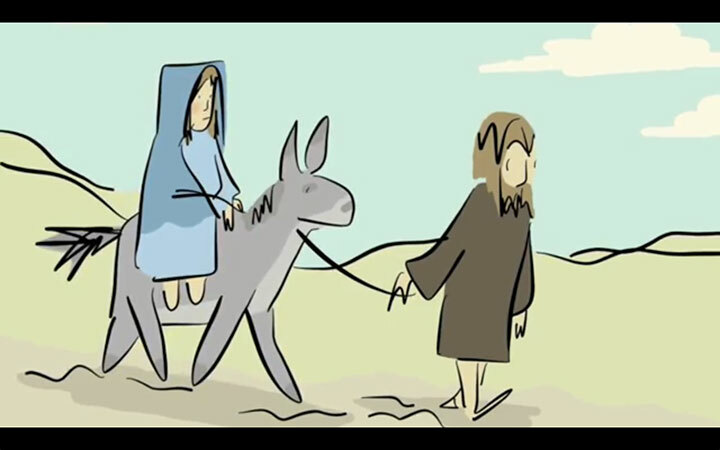 Don't forget, God Is Disappointed in You makes a great gift for the believer or nonbeliever in your life -- or grab the ebook version to read on your shiny new devices! Ho ho ho and happy holidays from Top Shelf!